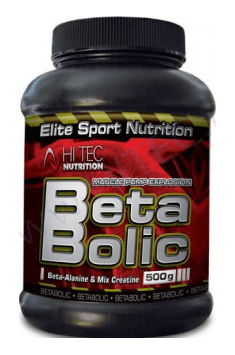 BetaBolic provides the optimal dose of the most advanced, metabolically active and stable forms of creatine in combination with beta-alanine and taurine catabolic. Magnesium chelate, esters and alkaline form of creatine found to be the most effective and safest forms of giving the super-anabolic component. In addition, creatine coupled with key components of the energy production cycle - citrate, malate, alpha-ketoglutarate - increases muscle cell work during exhaustive exercise. BetaBolic is composed of a highly innovative and effective muscle acidic buffer in the form of beta-alanine, which is converted into the muscle cells to carnosine. Excessive acidification causes severe pain and sudden collapse of a series of muscle strength training. BetaBolic will cross the threshold of "momentary muscular failure" while performing forced reps and quickly complete stock of ATP for the next series and training. One portion (4.4 g) in the morning on an empty stomach and one portion (4.4 g) after a workout. One portion (4.4 g) in the morning on an empty stomach. The procedure of the above recommendations should produce satisfactory results, but taking it on an empty stomach is not necessary. It should be used for at least 8 weeks.